June 27. The community was all in for Year 14 of Big Day at the Lake this past Saturday. More than 150 at-risk children from Big Brothers Big Sisters were treated to a really big day on the lake by 100 Boat Hosts. All told, an estimated 600 people participated. 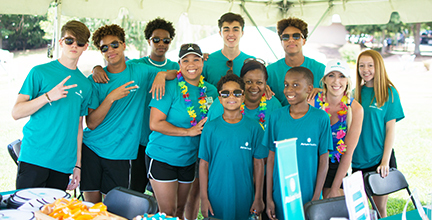 Stormy weather before and after the event underscored the awesome lake time for at-risk kids who would otherwise not experience a full day of fun on Lake Norman. More than 500 attended the picnic at Duke Energy Explorium. “Big” refers to not just the size of the event, and the number of volunteers, but the mentors provided by Big Brothers Big Sisters. Virtually every aspect of the day-long event was cost-free, thanks to generous donations from local businesses and individuals. The event is made possible through a large number of corporate sponsors, individual donors and literally hundreds of volunteers. 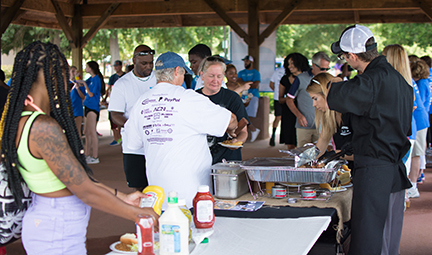 All in all, more than $115,000 was raised for Big Brothers Big Sisters of Central Carolinas. It has a 96 percent rating from Charity Navigator for accountability and transparency. Big Day at the Lake 14 started with the traditional early-morning Blessing of the Fleet, this year offered by the new senior co-pastors of Mt. Zion United Methodist Church, Angela and Jonathan Marlowe. NC Rep. John Bradford presented a North Carolina flag flown in honor of Big Day at the Lake over the Capitol Building in Raleigh. The Marlowes prayed for safety for all participants: Volunteers, Boat Hosts, Littles and Bigs. “Bigs” provide friendship, guidance and educational tutoring. Cornelius Police and Cornelius Fire provided tours and demonstrations of their respective boats. Individual Boat Hosts provided their time and hospitality; Freedom Boat Club pitched in with more than a dozen boats. Volunteers at the picnic grilled hot dogs, served food and ran activities for kids ranging from face painting to water slides. A half-dozen eateries provided everything from pizza and hot dogs to watermelon and ice cream. For a list of food sponsors, click here. Dave Yochum, the founder of the event, thanked all who participated. “Each year the event gains more momentum and the outpouring of generosity is more than we could have ever imagined,” he said. Dozens of sponsors, region wide, provide monetary and in-kind donations. Well over a hundred volunteers from area businesses and other organizations provide fundraising and volunteer help not only on event day but throughout the entire year. PayPal, based in Palo Alto, is one of two Presenting Sponsors of the event. Cornelius-based Champion Tire is the other. For a list of sponsors, click here. “PayPal’s core values focus on building strong, meaningful connections. Everything we do from customer and employee engagement, to community support, centers around this goal. We are proud and excited to be supporters of Big Brothers Big Sisters as the organization focuses on helping both Bigs and Littles connect and grow together. Providing children a mentor and helping to ensure their long-term wellness, is key to them reaching their full potential. We look forward to any opportunity we have to be a part of that mission and the Big Brothers Big Sisters program,” said PayPal’s Blair Black. Kevin Mahl, co-owner of Champion Tire, said the company gets a lot of requests each year for support. “Big Day At the Lake is one that we tend to always answer the call. We see it as a great way for us to invest in our local community, a way to build upon a solid foundation,” Mahl said. There’s the aspect, too, of giving a deserving young person a hand up via a mentor. “Big Day provides a means for the kids to gain a new perspective, one they would not otherwise have. Who knows, that perspective might provide them a source of new hope and inspiration, and who knows they could grow up to lead Champion Tire & Wheel. We’ve learned over the years that you just can’t make any assumptions or underestimate the power of people if just given a chance to succeed,” Mahl said. Next year, Big Day at the Lake will be held July 20.